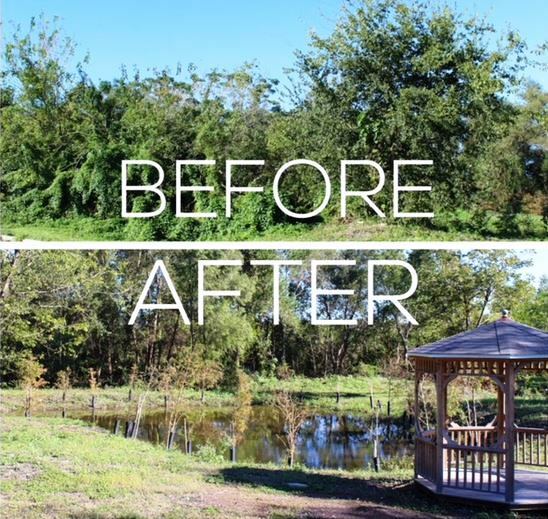 On November 26, 2018, the Sankofa Community Development Corporation (CDC) of New Orleans, Louisiana partnered with the National Park Service‘s Rivers, Trails and Conservation Assistance Program (RTCA) to develop a community-driven revitalization plan for a 40-acre wetland park. It’s located in the Lower Ninth Ward, which was devastated by the failure of the Army Corps of Engineers levees during Hurricane Katrina. Sankofa CDC was been awarded a partnership with the National Park Service RTCA to develop a comprehensive master plan to develop the Sankofa Wetland Park & Nature Trail on 40 acres of green space on the Florida Avenue Corridor. The project was first announced here, in the January 1, 2018 issue of REVITALIZATION. “The National Park Service Rivers, Trails, Conservation Assistance Program is excited about the opportunity to work with Sankofa Community Development Corporation and the Lower Ninth Ward residents to develop a community driven vision for the Sankofa Wetland Park & Nature Trail,” said Deirdre Hewitt, United States Department of the Interior, National Park Service Southeast Regional Office. This green infrastructure project is transforming a deteriorated natural area into an educational integrated wetland park with nature trails and boardwalks, interpretive/educational signage, stormwater filtration and absorption, trailheads, outdoor recreation facilities, and a bicycle trail. The Sankofa Wetland Park & Nature Trail highlights the role of wetlands in absorbing storm water and reducing land subsidence. The development of this natural environment fosters ecosystem education and recreational activities in the Lower Ninth Ward area. Over 400 people have visited the Wetland Park & Nature Trail during 2018, including students, school board members, scientists, educators, nature lovers, engineers, public health workers, city and state government leaders, and urban planners. 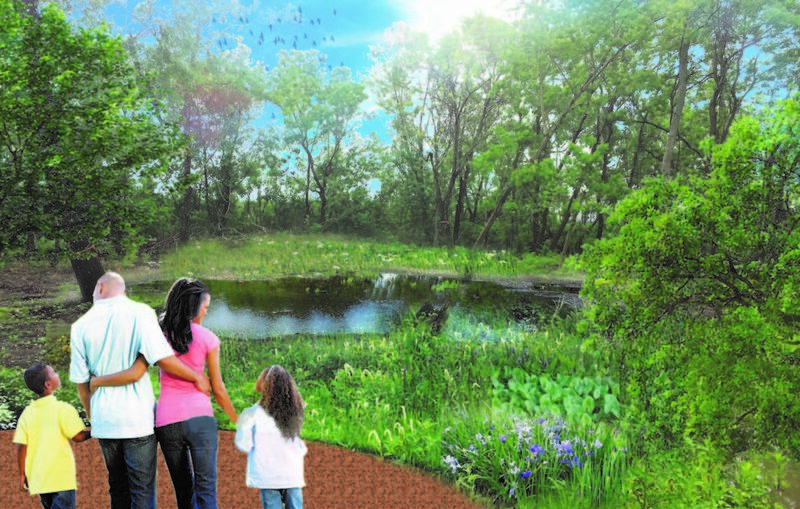 Upon its completion, the 40-acre Wetland Park & Nature Trail will be a significant green infrastructure project that addresses longstanding resiliency efforts of the neighborhood with educational, health, and recreational resources for all to enjoy. 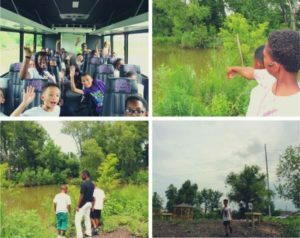 “This project will provide hands-on science learning activities to engage youth in designing, planning, and implementing the wetland park expansion in the Lower Ninth Ward area, which was devastated by Hurricane Katrina. This park is already attracting many visitors and is simply a beautiful place to hang out and learn,” explained Dr. Gary P. Shaffer, Professor of Biological Sciences, Southeastern Louisiana University. 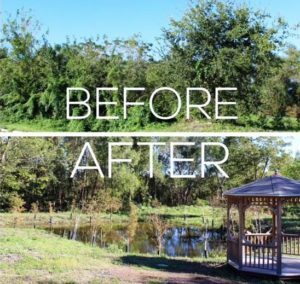 The first phase of the Sankofa Wetland Park & Nature Trail project was completed during 2017 as a 2-acre pilot at 6401 Florida Ave between Delery and Dubriell St. 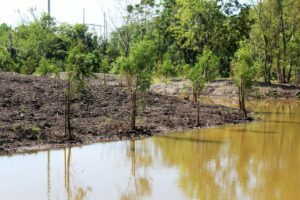 The construction of this section of the site included the removal of over 500 invasive tallow trees, followed by the planting of 300 cypress and tupelo trees and the formation of 2 water retention ponds. 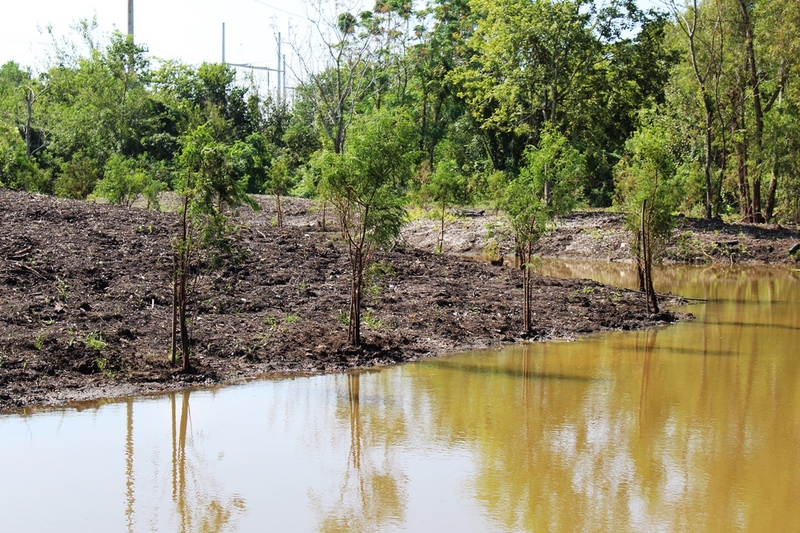 The Wetland Park & Nature Trail presently supports the flow of 81,000 gallons of water from city drainage units. “I am truly excited about the National Park Service’s investment into the Sankofa Wetland project which is located in the Lower Ninth Ward. This partnership will definitely serve as growth for the partnership will definitely serve as growth for the community as well as to create potential economic developments in the area. I have personally visited the area and I’m truly blessed to have Sankofa as part of my district,” added Councilwoman Cyndi Nguyen, New Orleans City Council – District E.
The next phase of the project will expand the site to 6 additional acres to enable the flow and storage of an additional 250,000 gallons of water. This expansion will retain up to 10 inches of rainfall, enhance wildlife and plant habitats, and monitor water quality improvement from the site’s green infrastructure features. The entire 40- acre Wetland Park & Nature Trail has the potential to retain over 2,000,000 gallons of water upon its completion. Sankofa CDC hosted the Community Forum on Climate & Equity during October 2018 at the Andrew P. Sanchez & Copelin- Byrd Multi-Service Center in the Lower Ninth Ward. The Community Forum was a part of a joint endeavor between the City of New Orleans and the Greater New Orleans Foundation in partnership with the Deep South Center for Environmental Justice and the Gulf Coast Center for Law & Policy. Over 80 community members were in attendance, including Martin Luther King Jr High School students, Lower Ninth Ward residents, and organization leaders. During the Community Forum we addressed how climate change impacts our daily lives in New Orleans. We also discussed City-wide approaches that could improve resilience, including new small business and employment opportunities, more transportation options, reducing waste, and smart cost-efficient energy systems. “This award and partnership with National Park Service RTCA provides a tremendous opportunity for the revitalization of the entire 40-acre Florida Ave Corridor in the Lower Ninth Ward. 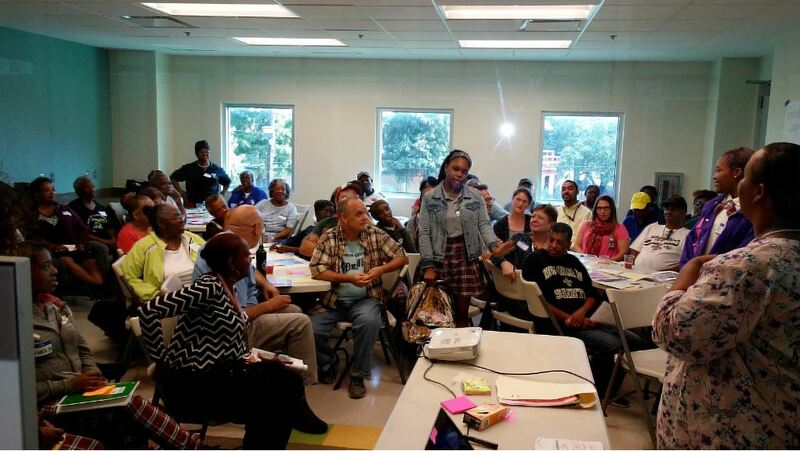 Through citizen-centered planning we will create a destination space for people to learn about the importance of wetlands and green infrastructure in our environment,” said Rashida Ferdinand, Founder and Executive Director of Sankofa CDC.